I saw this recipe on someone's blog (sorry can't remember now), and I just had to make it! It's so good!! 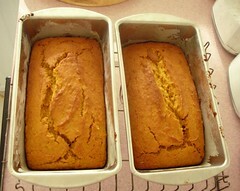 Here's a link to the recipe - Ginger Pumpkin Bread. I love to bake when the weather starts to get a little cooler. I didn't do the icing - If I make it again I think I would add it to give it a little more sweetness. 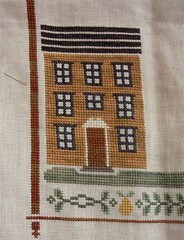 I stitched a little bit last night while watching Grey's Anatomy - I almost got the roof done, which was my little goal. I just have to fill in with Onyx. Pear Tree Inn as of 11/3/06. Well, not much else going on here... we're just going to have a lazy Saturday. I plan on doing laundry and maybe squeeze in a little stitching. My goal today is to get the roof done and start on the tree. Write later! Boy, that bread looks delicious! The bread looks amazing. I love the goal idea, the pear tree inn looks great! 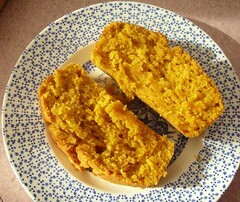 I love anything made with pumpkin, and ginger - your bread looks yummy. And Pear Tree Inn is looking very yummy too. Pear Tree Inn is looking great. Love the look of that pumpkin bread. ohhh that Pumpkin bread looks good!